News - New End Plates for NL-B Armstrong Lifting Magnet End Plate - Armstrong Magnetics, Inc. Since 2015 we've been supplying NL-B series lifting magnets with new end plates which are made of Aluminum alloy. The end plates are thicker than the old versions of NL-B lifting magnets and thus are more sturdy and more resistant to impact. 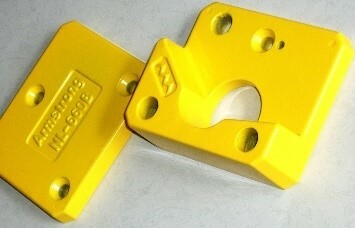 The front plate has a casted logo representing Armstrong Magnetics, and the back plate is casted with the model number of the lifting magnet equipment. The plates appear in modern shape and beautiful color. The safety, firmness and durability of NL-B lifting magnets are our design priorities. Now with the new thicker end plates, along with solid handles and safety latches lowered in a protection slot, the lifting magnet products are so firm that it can hardly be damaged even in harsh-mannered useages. For NL-B series lifting magnets devices, we provide 5 year limited warrantee and lifetime repair and parts replacement. In fact, there is almost no claims from our customers for damages of NL-B lifting magnets. 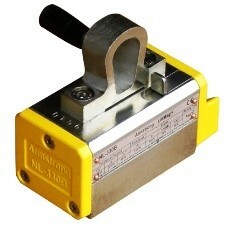 We are proud that Armstrong's NL-B series lifting magnets are almost free of repair.